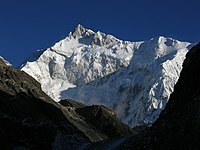 English: Sikkim (Nepali: सिक्किम, Tibetan: Denzong) is a landlocked Indian state nestled in the Himalayas. It is the least populous state in India and the second-smallest in area after Goa. The thumb-shaped state borders Nepal in the west, the Tibet (China) to the north and the east and Bhutan in the southeast. The Indian state of West Bengal borders Sikkim to its south. Despite its small area of 7,096 square kilometers (2,740 sq mi), Sikkim is geographically diverse due to its location in the Himalayas. The climate ranges from subtropical to high alpine. Kangchenjunga, the world's third-highest peak, is located on the border of Sikkim with Nepal. Sikkim is a popular tourist destination owing to its culture, scenic beauty and biodiversity. Gangtok is Sikkim's capital. The following 200 files are in this category, out of 342 total. This page was last edited on 31 March 2019, at 16:47.